The Robin Hood in the Argus Glass helmet! This is volume 7 of the Complete Adventures of the Moon Man. The Moon Man, in reality, Detective Steve Thatcher, first appeared in Ten Detectives Magazine, June 1933. He stole from the rich who were involved in crooked politics, landowners who cheated their tenants, and racketeers in Great City. Every dime he took was distributed to impoverished families by his associate Ned “Angel” Dargan. Dargan and Thatcher’s fiancé Sue McEwen are the only two that know his secret. At police headquarters, his father is the Chief of Police. Sue’s father, Gil McEwen is hellbent on taking the Moon Man down. He is joined by perhaps a more fanatical policeman in Detective Mark Keanan. Where McEwen is simply motivated by the law, Keanan isn’t above framing the Moon Man for more crimes. In “Preview to Murder,” a nasty trio is blackmailing Steve Thatcher with a film that catches both Steve and Sue in compromising circumstances! In “Ghoul’s Carnival,” Angel is taken by the police, then seized by crooks, then apparently killed in a gunfight… BEST IN BOOK! And here the stories from the old magazines end. The Moon Man has appeared in at least one cameo, this one coming in the Peregrine stories by Barry Reese. Hopefully, more stories are yet to come! 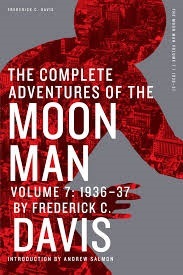 I give this final volume of the Complete Adventures of the Moon Man five stars!